TORONTO – On a night when the Toronto Raptors lost their first-round series opener to the Orlando Magic despite being 9.5-point favourites at home, silver linings weren’t easy to find. Kyle Lowry played better than his stat line would indicate, but he finished the game with as many points as you did. Kawhi Leonard and Marc Gasol mostly impressed in their Toronto postseason debuts, but the former defensive player of the year winners got their wires crossed on the final possession, leaving D.J. Augustin uncovered for the game-clincher. Nick Nurse, coaching his first playoff game, didn’t use Leonard enough. Unfortunately, the list of positives is not a long one. But Pascal Siakam is at the very top of it and that’s not an insignificant development for this team’s playoff hopes. Despite breaking out in his third NBA season, nearly earning all-star recognition and emerging as the favourite to win the league’s most improved player award, Siakam was something of a wild card going into Saturday’s Game 1. He had already appeared in 12 career postseason games, but hadn’t logged more than 28 minutes or scored more than 11 points in any of them. This would be his first playoff run as a prominent and featured player in Toronto’s lineup, which is an adjustment in and of itself. Additionally, the matchup didn’t exactly seem favourable for Siakam. No team defended the dynamic forward better than Orlando this season. The Magic kept him under 16 points in each of the four meetings. Siakam averaged 17.4 points against the rest of the NBA. They held him to just 34 per cent shooting. He shot 56 per cent against everybody else. There aren’t many players who have had success slowing Siakam down and keeping him out of the lane or away from the rim over the past six months, but Magic sophomore Jonathan Isaac is one of them. With his athleticism and lateral quickness, Isaac has the rare ability to keep Siakam in front of him, and at 6-foot-10 with a massive 7-foot-1 wingspan, he’s got the length to challenge his high release. Safe to say, he was aware of it. The first two questions Siakam faced a couple days before the playoffs began were about the Magic forward and how Isaac had defended him, and he dodged them both. “That’s your first question?” he responded before speaking more generally about Orlando’s length. However, if Isaac or the Magic were in his head, you wouldn’t know it on Saturday. Siakam may have gone into Game 1 as the Raptors’ biggest wild card but he came out of it as one of their lone bright spots. 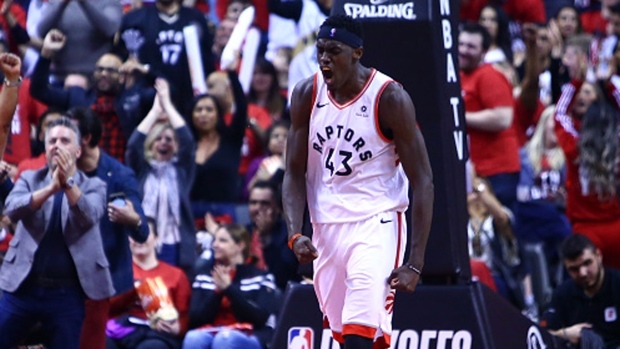 After taking a notable step forward in his second year and turning heads around the NBA with his development over the summer, Siakam was expected to take an even bigger leap this season. But few anticipated him growing this much this quickly. The 25-year-old averaged 16.9 points per game, nearly 10 more than the year prior, in addition to 6.9 rebounds and 3.1 assists on 55 per cent shooting – all career-bests. As the year went on he became a crucial part of the way the team played. At worst, Siakam was their third offensive option. But with Lowry and Leonard missing a combined 39 games to injury and load management, Siakam often functioned as their second, and occasionally even their first, scorer. He took the pressure off Leonard to carry the load and allowed Lowry to settle into a more complimentary role, which seemed to suit him more. But would it translate to the playoffs, when opposing teams have more time and incentive to lock into what star players do best and try to take those things away? There’s still a long way to go. That he passed his first big test is encouraging. The Raptors leaned on Siakam even more than usual on Saturday, with backup forward OG Anunoby out following an emergency appendectomy last week, Lowry struggling on the offensive end and Leonard inexplicably limited to just 33 minutes. While he certainly delivered, there was room for improvement. After shooting 37 per cent from three-point range this season, just above league average and a significant jump from last year’s historically bad 22 per cent mark, Siakam missed all four of his attempts in Game 1. For Siakam, the degree of difficulty will continue to go up. Despite the strides he’s made as a shooter, his strength and preference is still to put the ball on the floor, get to the rim and make plays for himself or his teammates, and Orlando knows that. So will future playoff opponents. Until he starts knocking down those outside shots, they’re going to play him for the drive and dare him to shoot. How he adjusts could play a big role in determining how far this Raptors team is able to go. There will be bigger and tougher tests to come but, to his credit, he hasn’t seemed fazed by any of the challenges he’s faced to this point.